A winter wedding in New York certainly has its romantic perks: the city strewn with holiday lights, a fresh dusting of powder white snow, and generally less congested outdoor areas for getting great shots. 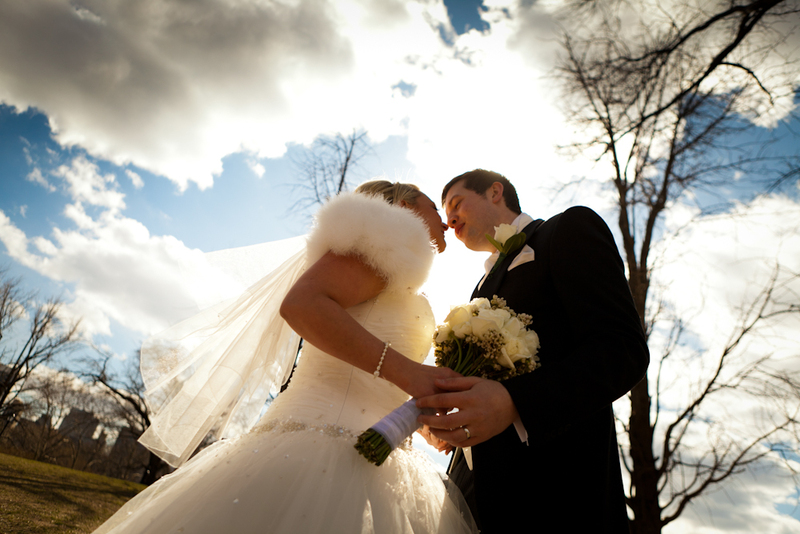 However, a winter winter wedding can also mean having to bear some pretty cold temperatures. Check out my list of winter wedding must-haves to be sure you are prepared for anything and can focus on enjoying your day! A stole or warm wide scarf to match your dress - You may think you are tough enough to sport a sleeveless dress mid-winter, but the truth is that sometimes weather will win and you'll be happy to have the option for a bit of warmth but still look cute. Layer up under your dress with thermal leggings or leg warmers - leg warmers are great even with shorter dresses as they can easily be stripped off or hiked up out of sight. Hand & feet warmers - Get some hand and foot warmer packets! You can grab them at any drug store in NYC, they heat up when exposed to the air, are surprisingly hot and last for hours! Knee socks to the rescue! With a long dress no one will even notice. Gorgeous Autumn wedding photo-shoot - So many colors!! !